Kenzee Oller rounds up a seasonal guide to running races in Stockholm and some popular ones worth checking out. Most people know that fall and winter months in the Nordic countries can be brutal. From cold temperatures and long dark days to endless snowfall, many want to head straight indoors. However, outdoor exercise is one of the best ways to beat the winter blues during those long days. Stockholm gives you plenty of chances to lace up your running shoes and head out for a bit of friendly competition with some of the locals during those long days . This race is a race for the girls out there. Translating to the ‘girl’s mile’ this is the perfect race for beginners. Running one Swedish mile (10k) around the island of Djurgården, you not only get to see views from all over Stockholm, but can also experience running with just women at every running level. This race is a bit more on the competitive side. 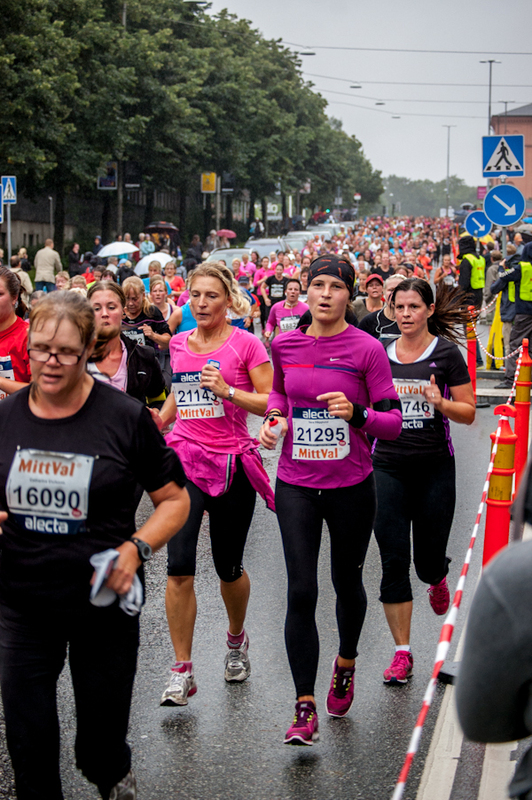 As one of Stockholm’s largest running races with over 15,000 people, this is a race that is perfect for the history lover. Running through the Swedish Parliament, The Royal Opera, The Stockholm Cathedral, as well as the Royal Castle, you will definitely feel history in the air as you run this 21km race through the city. This race is 10k running through Kista. As Swedes would say, this is a ‘lagom’ race, not too tough and not too easy, but just enough. Perfect to beat the rainy fall day blues. This is Stockholm’s largest cross country race. With many different runs to choose from, the 30km run is the longest, and many people say that it is more difficult than a full marathon. This is a perfect race for those that like to get dirty. Running through the forest during the heart of Swedish fall will not only be a beautiful sight to see, but definitely a muddy one. Established in 1915, this is one of the oldest races in Stockholm. This 10km race through the northern part of Stockholm will give you a bit of a different feel than running in Central Stockholm. A 30 minute metro ride north of the city will allow you to see something a bit different than the normal areas of Stockholm. Bundle up for this one. A run throughout Stockholm at the beginning of November may not be the warmest race that you will endure, but will definitely help you get over the depression of the winter months with some endorphin and one last opportunity to run a marathon in 2016. End the year with a 10k race. Bundle up for this one, grab some friends and get one last run in before the champagne and fireworks. Better to start your New Year’s resolutions earlier rather than later. Kenzee Oller is a Stockholm-based writer with a new found love for distance running and running races.